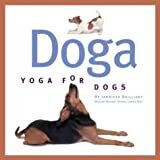 It was only a matter of time and now it’s here: Yoga for dogs! And it is here in Australia, too. We’ll see if we can cover this in an upcoming episode. …someone please let us know when you find pilates classes for dogs. We met at teh Million Paws Walk on Sunday – I had the Mostly Mutts PEt Accessories stall, and also do Puppyware Parties. Are you going to be using any of the footage on your website/podcast? Do you live in the Brunswick/Coburg area? I just thought maybe you did with having interviewed the dog walker from Lonely Pets and Dr Chiang (he’s actually our vet too – we live across the road from the clinic). Re Pilates for dogs – I know that The Paws Store in Williamstown do Doga so you might like to contact them about it. Would be happy to talk more to you about featuring Puppyware Parties on your podcast and I can promote Hound TV through my monthly newsletters. Thanks for your comment. It was great to see you on Sunday. I’ve e-mailed you off-site about all of this.